It’s that time of year again! Wedding season is in full swing at this point, and I’d bet most of you have one coming up. I just went to one a couple weeks back, and I sported this gold Rubin Singer number I found on sale at Neiman Marcus over the holidays! I couldn’t afford to buy it at the time because of all the house stuff I was paying for, but my sweet grandmother found out and surprised me with it for Christmas! I was so excited to finally have an occasion to wear it with the wedding two weeks ago. I will NEVER get rid of this dress – it’s a work of art. 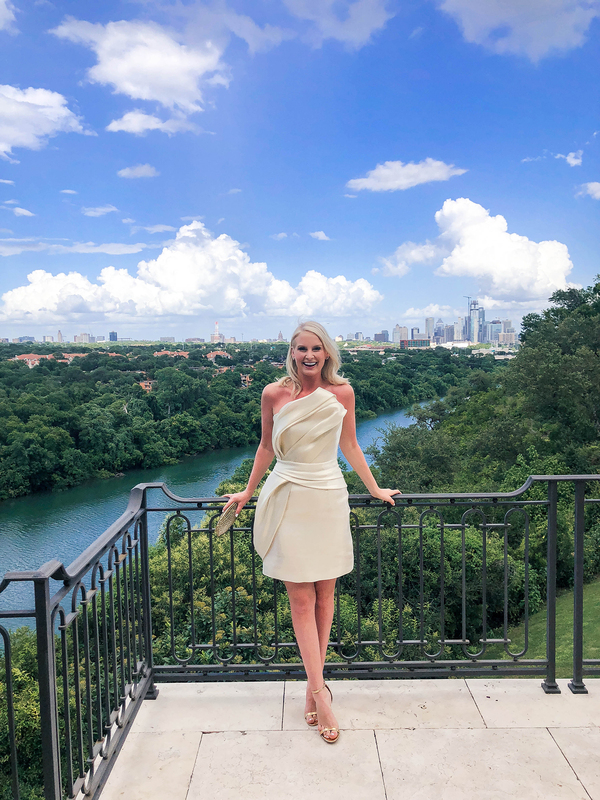 While my dress is no longer available to shop, I thought this would be a great time to share some of my favorite wedding guest dresses for summer at every price point. Scroll down to shop them all! This color is so fun and unique, and the silhouette is perfect for the dance floor! Now on sale for under $50. If you don’t mind a fitted dress, try this bow twist look from Nordstrom! Comes in four colors and looks great in person. Speaking of color, this hot pink number would look gorgeous with neutral heels and turquoise earrings! This dress has a Yumi Kim look for under $80! Perfect for a beach, mountain or garden wedding. If you prefer more muted colors, check out this soft grey lace piece. This little pink dress would be so useful for a variety of functions: showers, luncheons, weddings, work events. Black tie wedding? Don’t miss this citron-hued ruffle maxi. Here’s another great black tie option in a similar color! This lace dress comes in four colors and reminds me of that very popular Self-Portrait style. If you’re looking for styles that can transition into fall, don’t miss this and this. This ruffled turquoise gown is another style that would easily work into fall/winter! Love this red+pink combo gown for a black tie wedding! If it’s an outdoor wedding and it’s going to be hot, this striped dress might be a winner. Adore the structure and color on this dress. This dress is definitely a multipurpose style for day or night events! Love the contrasting navy blue lace on this periwinkle number! This dress is on the verge of being too white, but I think the print dominates it enough to make it appropriate. Such a pretty silhouette! If you like a little sparkle, check out this gown for a black tie wedding. I know this dress would be far too short on me, but if you’re a small gal you need to see this number! So freaking cute. A flowy, romantic silhouette with two gorgeous color options! This Yumi Kim floral midi is perfect for an outdoor/beach wedding. This dress doesn’t look like much online, but I ordered it and tried it on and it is AMAZING! So flattering and the colors and metallic accents are so gorgeous in person. If you love the color I’m wearing, check out this champagne-hued satin dress! Not the same silhouette, but so gorgeous! Love the neckline and back of this hot pink gown! Ideal for a black tie wedding. LOVE the print mashup on this Saloni dress!! To die for. If you’ve got darker skin or a great tan, this dress would look incredible! Obsessed with the mixed print happening on this Alexis number! The layers on this waterfall ruffle dress give it a delicate, feminine touch. If you prefer a modest silhouette, check out this cool embroidered jacquard midi! LOVE this dress! Only a size small left, but it’s 50% off! For a black tie wedding, I love this beige option with the luxe braided trim. I found two MAJOR dresses on major sale – this and this are sure to wow at any wedding you’ve got on the books. If you’re on the hunt for a gown for a black tie affair, don’t miss this and this. This is one of my very favorite Marchesa Notte pieces. Here’s another fab cocktail dress in the gold/beige/neutral fam. Love the pleating and sculptural details on this number from Tibi! For a more casual wedding, try this Rebecca Taylor piece. An item you could definitely wear again a bunch post-wedding! This one is another dress I tried on in person and it is so beautiful! I only returned it because it was too big and I didn’t have time to order another before my trip. The fabric is beautiful though! This pink tiered strapless dress is definitely party ready. The print and color scheme on this Saloni dress is so pretty! This pink gown is 30% off, but there’s only a size IT36 left! Obsessed with this gold look! The sequin embellishments and tiered ruffles give it all the red carpet vibes. Your dress is so cute! It is so flattering! Love all these curated options!